Clarity Media is a creator and supplier of Wordsearch puzzles, which can also be displayed online as well as in traditional print media. We can supply wordsearch puzzles of any grid size and to any rule set depending on your requirements - for instance whether clues should run forward, back, diagonally or a combination of all three. We can write wordsearches on a wide variety of topics on request from our large database of categorised words by topic. You can choose the colours and display format of your completed wordsearch puzzles. To see a demonstration of one of our many Wordsearch puzzles integrated on a website, take a look at the Sample Wordsearch Puzzle. 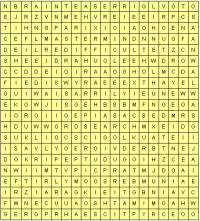 For offline publication, we supply word search puzzles in PDF format. Here is a Sample Wordsearch PDF - the solution is on the second page.